DALLAS — Nearly 870 lots of important and historically significant objects relating to the life of President Abraham Lincoln debuts Sept. 17 in Heritage Auctions’ Lincoln and His Times, a rare joint auction presented in cooperation with the publishers in celebrating the 20th anniversary of The Rail Splitter, a respected publication for enthusiasts of Abraham Lincoln and related memorabilia. “In creating this auction, Heritage has made a conscious effort to include something for everyone, both in terms of subject matter and value range,” said Tom Slater, Director of Americana auctions for Heritage. “The auction includes many interesting but affordable lots with minimum opening bids of just $1 as well as numerous five and even six-figure rarities of museum quality. We’re also pleased to point out that not one of these lots from more than 75 individual consignors carries a consignor-set reserve. 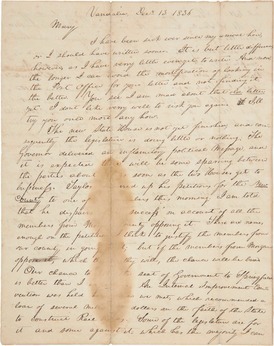 The entire “Lincoln and His Times” auction is available for viewing and interactive bidding at HA.com/6163. Or a full-color catalog picturing all the items in the auction may be ordered by emailing HA.com/catalogs. Questions or comments about the auction should be directed to TomS@HA.com or DonA@HA.com. Heritage Auctions is the largest auction house founded in the United States and the world’s third largest, with annual sales of more than $800 million, and 950,000+ online bidder members. For more information about Heritage Auctions, and to join and receive access to a complete record of prices realized, with full-color, enlargeable photos of each lot, please visit HA.com. Want to get the up-to-the-minute updates and breaking news stories about Heritage Auctions? Get them as they happen at: HA.com/Twitter; Facebook: HA.com/Facebook. To view a complete archive of Heritage press releases go to: HA.com/PR. To link to this press release on your blog or Website: HA.com/PR-3001.